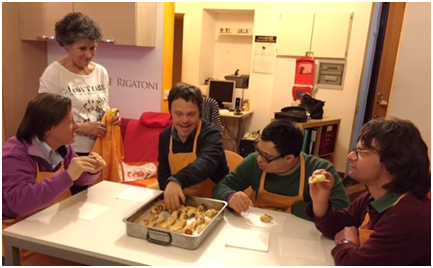 Every Monday morning, six volunteers of the AIPD – Italian Association of Down Syndrome Persons – hold a basic cooking class for a group of seven adults with Down Syndrome who live on their own in a family home. The lesson consists of creating simple pasta or rice, meat or fish dishes, savory pies and desserts. All the participants are helped to perform the various steps of the preparation of the ingredients (cutting, slicing, weighing the right quantities, mixing, etc. ), with the aim of stimulating their manual skills and involving them as much as possible. 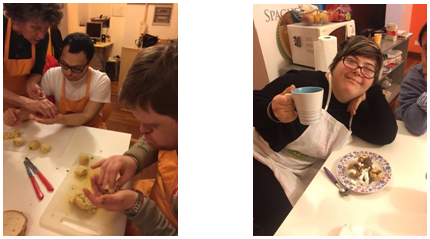 During the cooking of the main course, participants under the supervision of the volunteers also prepare simple sweets or savory snacks (e.g., biscuits filled with jam or chocolate, small sandwiches with cheese and ham, mini brioche, a cup of tea or coffee or soft drinks), to be eaten immediately and without hesitation. At the end of each lesson, which usually lasts a couple of hours, the participants bring home the printed recipe and a portion of the dish they have prepared. Thanks to the friendship that has been created between the volunteers and the participants, the meetings take place in an atmosphere of serenity and cheerfulness. The enthusiasm with which the participants join the lessons and the results obtained are also stimulating and gratifying for the volunteers.